The following article was written by OCO member and concerned consumer/farmer Andrew St. Jean in response to a study carried out by Farmers Feed Cities called the “Informed Food Philosophy Study”. Andrew points out right away how research can always present just about any philosophy one may already have. The way the research was described, as well as corresponding media coverage, belittled the organic sector and small niche farmers. Currently, 14% of Canada’s land is certified organic and the number of certified organic farms has increased by 66% from 2001-2011. The organic market is growing at a fast rate and more and more consumers are demanding organic. As Andrew points out, a lot of organic food is imported, primarily from the United States, leaving lots of room for Ontario and Canadian farmers to take advantage of the demand for organic products. Contact Mary at mary@organiccouncil.ca or Andrew St. Jean at astjean@willburellis for more details. The beauty of research is you can construct questions to prove, display, or present just about any philosophy you may have. Recently, Farmers Feed Cities took this initiative upon themselves to displace some of the myths surrounding what Canadians are eating. The unfortunate part is, like many other research “studies” they constructed strategic questions, which they would not release, to depict the one-sided agenda in their food philosophy study. The mission statement of Farmers Feeds Cities explains that, “Farmers Feed Cities is committed to increasing the understanding of the value that farmers contribute to Ontario’s economic physical and social health. Farmers Feed Cities is committed to ensuring a sustainable future for farmers in Ontario.” Their vision is that, “Farmers Feed Cities will be a major driver in ensuring a thriving and sustainable farming industry in Ontario. We will promote a greater understanding of the significant contributions made by farmers to the wellbeing of our province.” Farmers Feeds Cities has recently appeared in two television interviews, one on CHCH and another on CTV Ottawa morning news and have also released the results of a food philosophy study they conducted. All of these projects should impart the mission and vision of Farmers Feeds Cities however they instead have specifically targeted and belittled small, niche farmers and organic farmers. Farmers feed cities is supposed to represent the voice of ALL farmers and Ontario agriculture, promoting a strong community and sharing the truth about agriculture in Ontario. 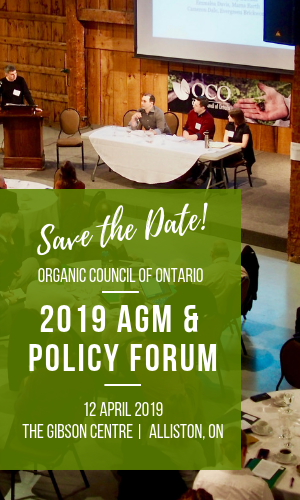 However they seem to be focused on an agenda that illustrates their own preferences: promoting the safety of GMOs and belittling organics and small niche farmers. If an organization is going to claim to be the voice of reason for farmers and help better educate consumers, the least they could do is be objective. The study highlights that Canadians are aware that less than 2% of farms are organic. Yes, less than 2% of the operators may be organic, but nearly 14% of the land in Canada is certified organic. Stats Canada has 205,730 farms recorded in 2011, of those 102,571 of them had gross farm receipts of less than $50,000, this being the majority of Canadian farmers. However in this same 2011 census, the majority of organic producers fell between the ranges of 50,000 – 99,000 and 100,000 – 249,999 showing the viability and success of the industry to Canadian agriculture. Not to mention that the total number of Canadian farms have declined by 17% from 2001 – 2011 while the number of organic farms have increased by 66% over this same period. Organic standards have only been government regulated since 2009 and the industry has grown by more than 50% in this time.Farmers Feeds Cities cites OMAFRA estimating that imported products make up over 70% of the organic food consumed in Canada while failing to mention this was an estimate from 2010 and since then the industry has grown by nearly 50%. Companies like Yorkshire Valley, Organic Meadow, Harmony, Natures Path and many other organic Canadian companies have found their way into the grocery store since 2010. They also failed to mention in this study that 75% of the imported products come from the United States. Not all of these products are coming from overseas as it seems to be implied by Farmers Feed Cities. Not everything can be grown locally, and if consumers want it, grocery stores are going to stock it. I currently live in Windsor, Ontario, minutes from the green house capital of Canada, Leamington, Ontario. Ontario has more than half of Canada’s green house space with the majority of it being in south western Ontario where they grow peppers and tomatoes in greenhouses year round. Do you think you can find Ontario grown tomatoes and peppers in the grocery store year round? How often do you go to a Sobey’s, Metro, Zehrs etc. in October or November and can’t find Ontario grown apples? I surely can’t be the only one who has gone looking for Ontario produce, when in season and been unable to find it in the grocery store. Yes, buying organic does not always mean buying locally. However those who want organic and local will most often buy those products direct from a farm or be part of a Community Supported Agriculture (CSA). Retailers are not able to carry local products the same way they used to which is rarely talked about nor mentioned here. An example is in New Hamburg, Ontario, where at the time there was one grocery store, an IGA, and they would carry local asparagus when in season from the Walker Asparagus farm in town. Later the IGA was no longer able to carry local produce like this due to various regulations surrounding tractability and retailers wanting to have more central sources for goods. How we define local is again individual, local may be your town or city or grown in Ontario or maybe even Canada. Organic, conventional, or GMO does not define a growing region but a method of growing or type of seed used. The organic industry is still considered in its infancy having only been government regulated now going on four years. No, the processors have not all established themselves in four years in Canada to be able to take over store shelves so all organic items in the store are grown locally. As an organic grain marketer, I see how organic grains cross the border to be processed and return back to Canada to be sold or processed into finished goods. We have very few flour processors in Canada and even fewer in Ontario. However we have a much larger number of bakeries who use organic flour in their breads and baking. As a direct result of this study, there have been more misrepresentations of the Canadian and Ontario agriculture industry than myths busted.It seems organics and genetically modified foods are not the only areas Farmers Feed Cities are misinforming consumers about either. In their food philosophies press release they say, “Like people, animals only receive antibiotics or vaccines when they are sick.”I wonder if Farmers Feed Cities are the ones who need to be educated after statements like these. Have they never visited a feed mill to see all their medicated feeds with antibiotics in them, or visited a sow barn where vaccinating is a regular chore? Did they not ever wonder why Purina horse feed is made at a separate, antibiotic FREE, plant from its cattle feed which often contains rumensin, an antibiotic poisonous to horses? Consumers need to be educated, the information is out there but it is often clouded by studies like these. Consumers who really want local will go to local markets, roadside stands or become members of CSAs and know where their food comes from. If you want to know where your food comes from and how the animals are raised then get engaged. Go to your local butcher shop and talk to your butcher, they will tell you who the farmer is they get their beef, pork and poultry from. Many often tell a story about their farmers, like the Kingsville Butcher shop who promotes Fenwood Farms chicken and displays a picture and story about the farm. Knowing where your food comes from and developing food philosophies involves a lot more than reading survey results with a hidden agenda. Supporting local does not mean buying organic, and buying organic does not mean supporting local.All farmers and members of the agriculture community need to work together for the same cause, to promote this great provinces’ hard working and dedicated farmers. If you want to know your farmer, reach out and meet them. There are farmers from all walks of life on Facebook and twitter now, go to you farmers market, talk to your local butcher. If you want to know more, get engaged and be more involved, this is the only true way to know for sure where your food comes from and to be able to develop true food philosophies.